Rapidly crunching terabytes of big data can lead to better business decisions, but this has traditionally required tremendous IT investments. Imagine a large online retailer that wants to provide better product recommendations by analyzing website usage and purchase patterns from millions of website visits. Or consider a car manufacturer that wants to maximize its advertising impact by learning how its last global campaign performed across billions of multimedia impressions. Fortune 500 companies struggle to unlock the potential of data, so it’s no surprise that it’s been even harder for smaller businesses. 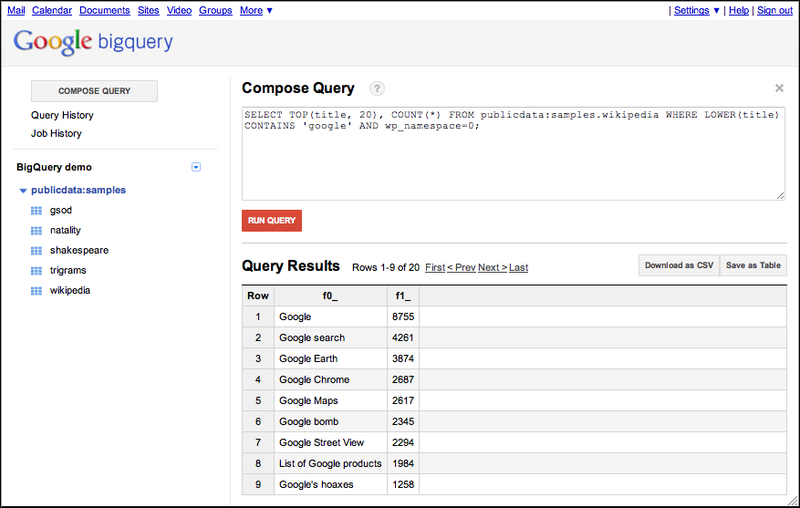 We developed Google BigQuery Service for large-scale internal data analytics. At Google I/O last year, we opened a preview of the service to a limited number of enterprises and developers. Today we're releasing some big improvements, and putting one of Google's most powerful data analysis systems into the hands of more companies of all sizes. We’ve added a graphical user interface for analysts and developers to rapidly explore massive data through a web application. We’ve made big improvements for customers accessing the service programmatically through the API. The new REST API lets you run multiple jobs in the background and manage tables and permissions with more granularity. Whether you use the BigQuery web application or API, you can now write even more powerful queries with JOIN statements. This lets you run queries across multiple data tables, linked by data that tables have in common. It’s also now easy to manage, secure, and share access to your data tables in BigQuery, and export query results to the desktop or to Google Cloud Storage. Michael J. Franklin, Professor of Computer Science at UC Berkeley, remarked that BigQuery (internally known as Dremel) leverages “thousands of machines to process data at a scale that is simply jaw-dropping given the current state of the art.” We’re looking forward to helping businesses innovate faster by harnessing their own large data sets. BigQuery is available free of charge for now, and we’ll let customers know at least 30 days before the free period ends. We’re bringing on a new batch of pilot customers, so let us know if your business wants to test drive BigQuery Service. Ju-kay Kwek is a Product Manager for Google BigQuery Service. The REST API calls are way easier! I am looking forward to the actual business usage.